A 16-year-old male patient reported to our hospital, and presented with pain and discharge in relation to the right maxillary incisor. On elaborating the history of present illness, pain was found to be intermittent in nature, with recurrent sinus tract formation, specific to the right maxillary central incisor (tooth #11). His past dental history reveals apexification being attempted for two years in the same institution, but in vain, due to the patient's incompliance to adhere to the clinical protocol. On intraoral examination, a sinus opening with discharge was located on the mucolabial fold, distal to the apical region of tooth #11. Thermal and electric pulp tests showed that the right maxillary central incisor did not respond to the vitality tests, whereas, all the adjacent teeth displayed a normal response, which suggested that tooth #11 was non-vital. Furthermore, the intraoral periapical radiographs demonstrated an incompletely formed root, with a blunderbuss apex, surrounded by periradicular rarefaction in relation to tooth #11. Also, the radicular dentin was thin and fragile with apically divergent canals, as is evident in [Figure 1]a. In order to assess the exact nature of the periapical tissues, with the patient's consent, an ultrasound was performed with a modified transrectal probe. A hypoechoic lesion measuring 6.5 ? 5.6 mm, with posterior acoustic enhancement, consistent with fluid collection, was seen near the root tip of the right maxillary central incisor [Figure 2]a. This loculation was associated with a focal erosion of the anterior wall of the alveolar socket, confirming the features of a chronic periapical abscess. From the above-mentioned findings, it was decided not to pursue with apexification, and hence, an alternative method of treatment was instituted, which involved the fabrication of a 'tailor-made endodontic obturator' for adequate obturation, to precisely match the root canal volume and defect with the aid of 'Spiral CT' and 'Endometrics'. where H was the thickness of specimen, A was the area of the cross-section at the top portion, and B was the area of cross-section at the bottom portion. The total volume of the entire specimen was computed by integrating the individual segments, which was found to be 149.625 cu mm. The apical 3 mm of the obturator was sectioned with a diamond disk to accommodate for Mineral Trioxide Aggregate (MTA) as a root-end filling material. Surgical phase: A mucoperiosteal flap was raised in the maxillary anterior region and the bony defect located. Following thorough debridement and curettage of the periapical lesion, the palatal cementum was retained and MTA was placed as a retrograde material and condensed against the resin obturator within the canal, which acted as a template. 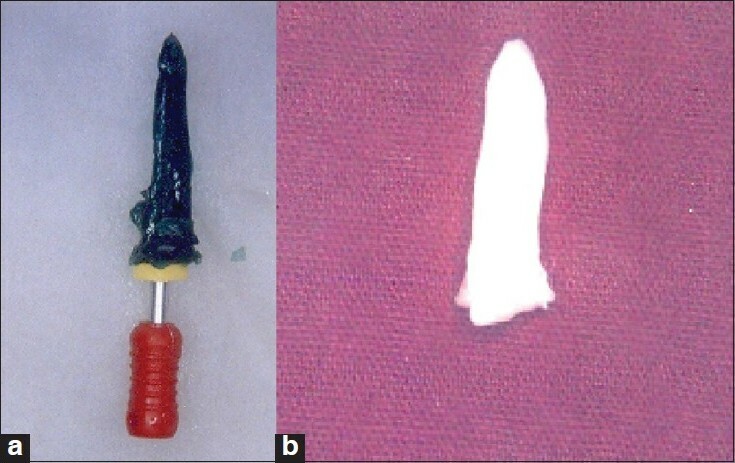 The resin obturator was then removed and a moist cotton pellet placed in contact with the MTA for 24 hours, to ensure its complete set as suggested by earlier studies. Obturation phase: After 24 hours the moist cotton pellet was carefully retrieved and obturation was completed by luting the endodontic obturator with dual cure resin cement. 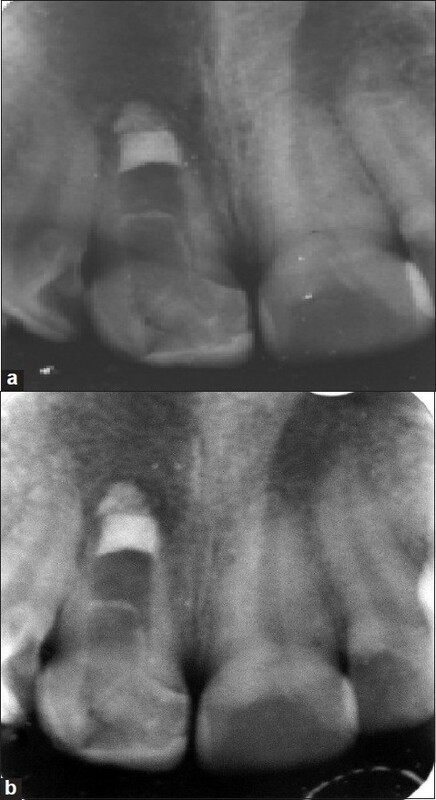 The access cavity was sealed with a light activated hybrid composite, as was evident from the postoperative radiograph [Figure 1]b. Six- and twelve-month follow-up radiographs demonstrated a significant reduction of periapical radioluscency, with no symptoms [Figure 4]a and b. The failure of apexification could be attributed to the probable destruction of the Hertwig's epithelial root sheath and the non-conducive environment in relation to the periapical region of tooth #11, which was evident from the hypoechoic images obtained with the ultrasound. Ultrasonography depicts the true nature of the lesion within the bone in three dimensions, and their content in terms of fluids, tissue, and vascularity, with the precise measure of the diameters of the lesion. , Roll-cone Gutta-percha obturation with lateral compaction is not the technique of choice, due to lack of resistance of the thin fragile dentinal walls to lateral pressure, as greater bulk of Gutta-percha requires a greater force for compaction. Henceforth, customization of an obturator to match the canal volume without lateral compaction will be attempted using PMMA, which is extensively used in the field of medicine for fixation of orthopedic implants, test kits, diagnostics, and so on, and this demonstrates its excellent biocompatibility with tissues. Also, heat polymerization of PMMA markedly increases the degree of conversion, reducing the availability of free monomers. Furthermore, the inherent ability of these acrylic resins to be custom formulated has enabled us to tailor-make a heat polymerized acrylic resin, as an endodontic obturating material. Despite the potential residual infection and the serious damage caused, MTA at the apical 3 mm, effectively promoted regeneration of the apical tissues, producing a desirable apical barrier, which was evident from the follow-up radiograph after a one-year period. 1. Camp JH, Barrett EJ, Pulver F. Pediatric Endodontics: Endodontic Treatment for the Primary and Young, Permanent Dentition. In: Cohen S, Burns RC, editors. Pathways of the Pulp. 8 th ed.India: Harcourt India Pvt Ltd; 2002. p. 797-844. 2. Weine FS. Alternatives to Routine Endodontic Treatment. Endodontic Therapy. 6 th ed. United States: Mosby Inc.; 2004. p. 513-44. 3. Trope M, Chivian N, Sigurdsson A, Vann WF. Traumatic Injuries. In: Cohen S, Burns RC, editors. Pathways of the Pulp. 8 th ed. India: Harcourt India Pvt Ltd; 2002. p. 603-50. 4. Ingle JI, Newton CW, West JD, Gutmann JL, Korzon B, Martin H. Obturation of the Radicular Space. In: Ingle JI, Bakland LK, editors. Endodontics. 5 th ed. India: Harcourt India Pvt Ltd; 2002. p. 571-668. 5. Cotti E, Campisi G, Garau V, Puddu G. A new technique for the study of periapical bone lesions: Ultrasound real time imaging. Int Endod J 2002;35:148-52. 6. Lustig JP, Lev Dor B, Yanko R. Ultrasound identification and quantitative measurement of blood supply to the anterior part of the mandible. Oral Surg Oral Med Oral Pathol Oral radiol Endod 2003;96:625-9. 7. Harper EJ, Behiri JC, Bonfield W. Flexural and fatigue properties of a bone cement based upon polyethyl methacrylate and hydroxyapatite. J Mat Scien 1995;6:799-03. 8. Maguire H, Torabinejad M, Mc Kendry D, Mc Millan P, Simon JH. Effects of Resorbable Membrane Placement and Human Osteogenic Protein- 1 on Hard Tissue Healing after Periradicular Surgery in Cats. J Endod 1998;4:720-5. 9. Hachmeister DR, Schindler WG, Walker WA 3 rd , Thomas DD. The sealing ability and retention characteristics of mineral trioxide aggregate in a model of apexification. J Endod 2002;28:386-90. 10. Matt GD, Thorpe JR, Strother JM, Mc Clanahan SB. Comparative Study of White and Gray Mineral Trioxide Aggregate (MTA) Simulating a One- or Two-Step Apical Barrier Technique. J Endod 2004;30:876-9. 11. Goto Y, Nicholls JI, Phillips KM, Junge T. Fatigue resistance of endodontically treated teeth restored with three dowel- and- core systems. J Prosthet Dent 2005;93:45-50. 12. 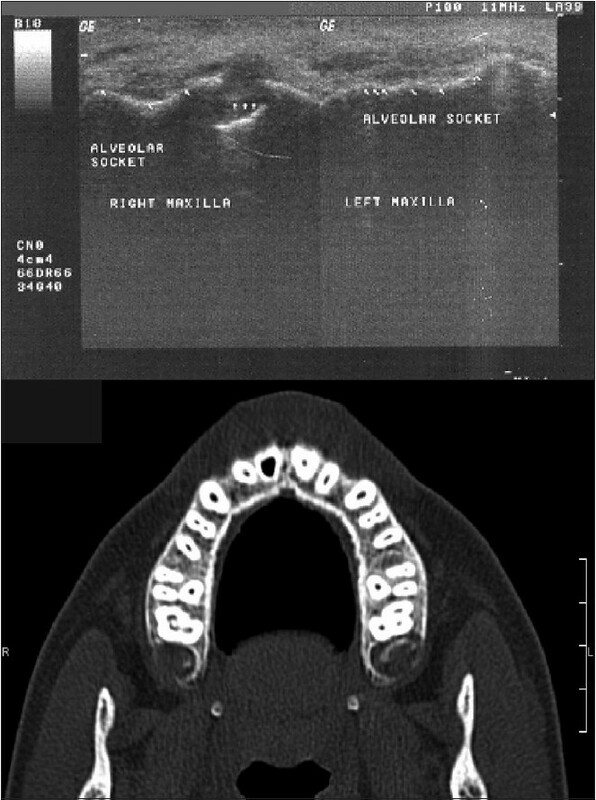 Hemamalathi S, Nagendrababu V, Kandaswamy D. A single step apexification and intra radicular rehabilitation of fractured tooth- a case report. J Conserv Dent 2007;10:48-52. 13. De Rijk WG. Removal of fiber posts from endodontically treated teeth. Am J Dent 2001;13:198-218. 14. Hayashi M, Shimizu A, Ebisu S. MTA for Obturation of Mandibular Central Incisors with Open Apices: Case Report. J Endod 2004;30:20-2.